I decided on a brand new drastic change for the novel today. In what is currently Chapter 17, I’ve got this nice dialogue between Damen and Brit about God. Damen is an agnostic and Brit is a Christian and they argue about God’s will. The rest of the chapter details Damen’s attendance in Brit’s church as well as a brief visit in Sunday School. I edited the conversation between Brit and Damen and continued with the rest of the chapter. It was not until I was nearly done with the chapter that it occurred to me that this conversation was way over the head of my character Brit Leighson. It is very clear that I am speaking through my character in this scene and while I still want to get across my message, it sounds false coming from Brit. It sounds as if I’m pigeonholing her into a personification of myself, which is what I really don’t want to do. I thought about this for a while. “Who should have this argument with Damen without it sounding trite or false?” Finally, it occurred to me that it should be Damen vs. the Sunday School teacher Ms. LaRoe, who I’ve not yet given a first name, even though I know she’ll also feature in Jill. I started to rewrite both scenes, but in minutes, I hit Undo and let what I had stand because it looked like too much work to edit. It ate at me though until I finally took a new document and started writing and deleting and writing and deleting until I had the precise scene I wanted with Damen and Ms. LaRoe. I looked at my new creation and was immediately disheartened. 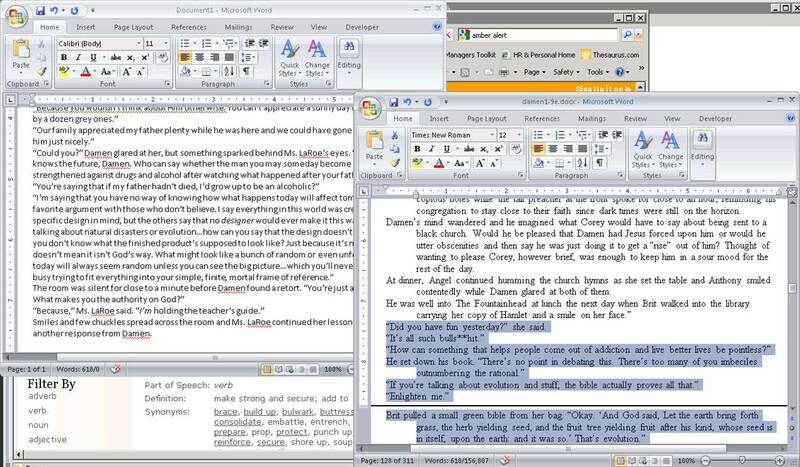 Here I am trying to reduce word count, but my new scene looked almost twice as long as the original text. I started to throw away what I’d written, but I shook my head and looked at the word count for the original scene. 618 words. I frowned and figured as long as the new scene was only 200 or so words more, I’d figure out what else I could cut to make it fit. To my absolute shock, the new scene was exactly 618 words. I was so shocked by this that I had to screenshot it to believe it was real!